The Oregon & Northeastern Logger (behind newly acquired US Army VO 1000's) is heading for the mill complex at Scanlon while across the creek NP train 664 (Silvies - Pasco) drifts downgrade behind three high nose geeps. I'll give this another thumbs up! Really like the water in the shot. I also like the first picture of the yard on the outside corner, makes it look much bigger. Welcome Coldriver! 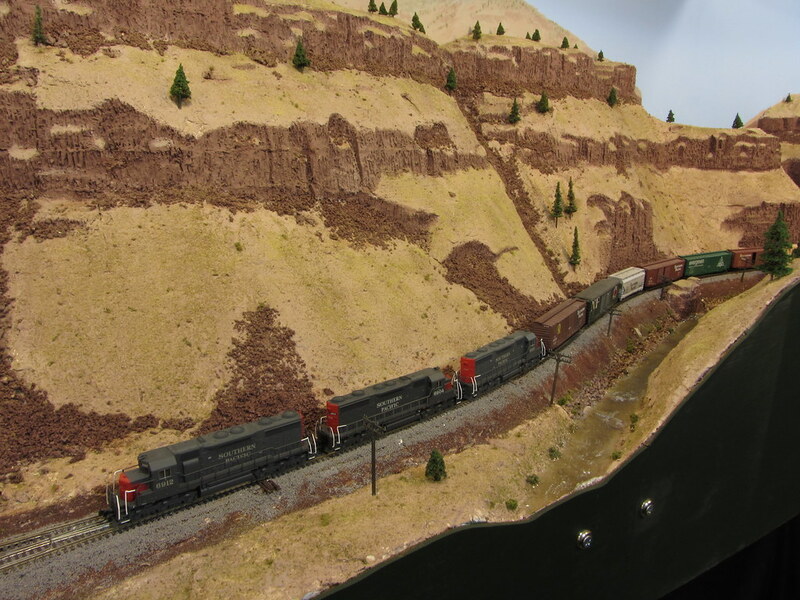 Great pics of your layout. 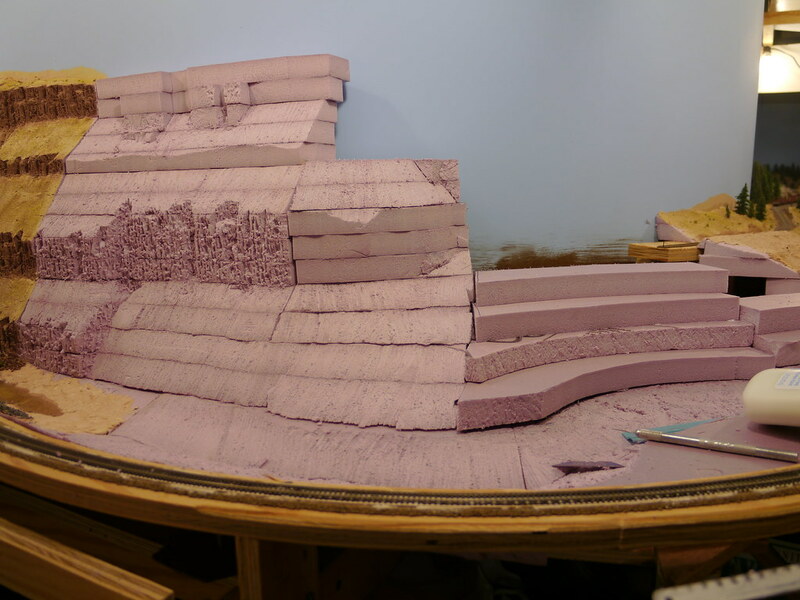 Truly a first class n-scale layout. Can't wait to see more pics/updates, and hopefully I can make it out to the next ops session. Thanks all for the kind words. I didn't intend to remain anonymous - my name is Dean Ferris from Decatur, TX (native to Washington state) and I'm Director of Network Strategy for BNSF Railway. Among my prototype duties is shortline valuations and lease extensions, so I really get to examine the nuts and bolts of what makes up a railroad and try to incorporate that knowledge in how I model. For example, I have a goal to maintain a five to one ratio of culverts to bridges (in my prototype experience the ratio is much higher, but it's a start). I don't have a track plan drawn up that I can share, but the layout is partially double decked with the lower deck mostly staging. The mainline is about 275 feet with four yards - I was a BNSF yardmaster earlier in my career so yards are a high priority for me. 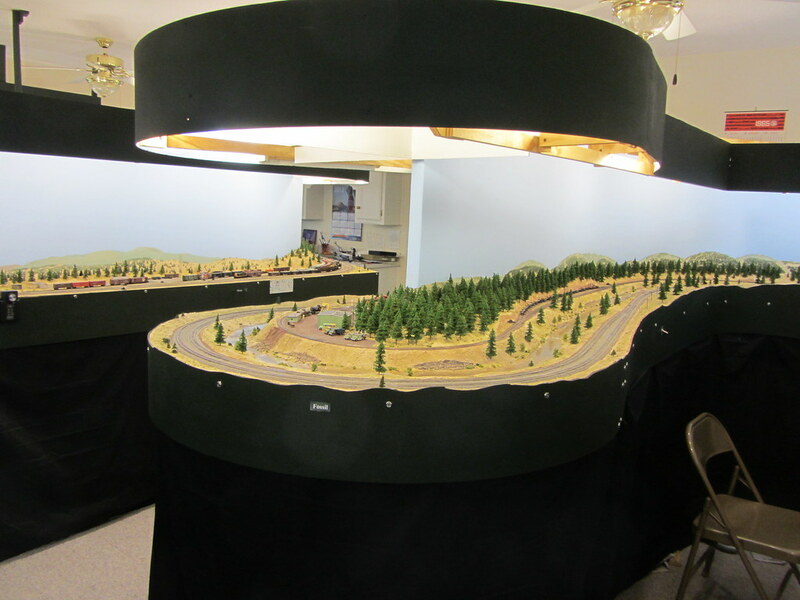 I have 17 staging tracks which can hold 25 car trains and I use NCE radio control. I've managed to avoid a helix - actually I built a helix, hated it, and ripped it out (granted, I did a lousy construction job...). Replacing the helix was a peninsula with the creek scene that many of you liked on one side with the log reload on the other, so obviously it was a good decision. As time allows I'll try to post some additional photos. Love the shots so far. Would love to see more of the overall layout and the yards. Here's a shot which gives a top to bottom view of how the layout looks - black sheets hanging from the fascia to the floor, backdrop framed with 2 x 2's and masonite, and then the light valence attached to the top of the backdrop frame. The intention is to give a shadowbox look. Someday I hope to cover the top of the valence to darken the ceiling so that only the layout is lit. Wow! Welcome to Railwire. This speaks to me. I'd love to see more. Shots of the layout in its evirons; close-ups of your favorite scenes; a description of your approach to ops; anything else you care to share. Fresh inspiration! That's just sick! Care to explain the basalt technique. The results speak for themselves, but I'd love an explanation as a side of one peninsula on my layout may be this type scenery to help with a feeling of operators traveling a distance when running trains on the mainlines. This is my first finished basalt canyon = Emigrant Canyon. 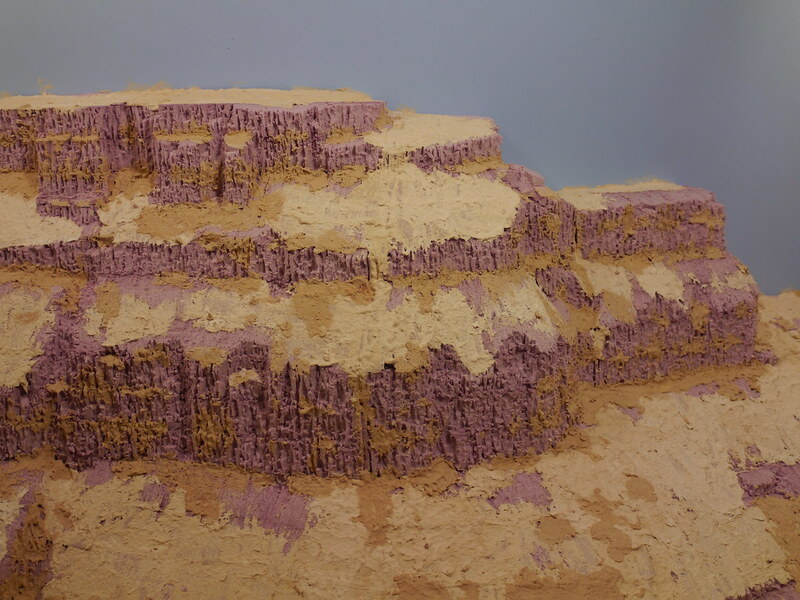 Basically I cut layers of pink foam to the basic shape, and take an Xacto knife to it until it looks right. If there is a secret to it, it's continually varying the cutting angle rather than 90 degrees to the surface so that the foam is not just sliced but tiny strips are removed as you carve. The other secret is to have good photos of pillar basalt on hand to use a reference for your cutting. This is Canyon Jr or David, the one I'm working on now is Canyon Sr or Goliath. The thing about this technique is that it's extremely time consuming, which has ultimately led me to neglecting the fact that I still don't have all my locomotive headlights working and such. By the way, pictured is NP train #658, an SP to NP runthrough from Roseville to Pasco. That is an outstanding scene! Nice work! That is an awesome looking layout.